Mom used this sentence to justify a lot of behavior when I was a kid: learning to ride a bike, auditioning for plays, joining the cross country team (I took 11th place in the city meet). And yes, mom played the lottery. She had a winning streak where, with a little help from technology and lottery dream books, she won several days each week for a few weeks. Naturally, those words rang through my head every time I was faced with a risk-reward decision. I won the lottery, and I didn’t buy a ticket. 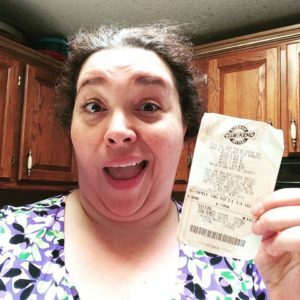 If you follow me on Facebook or Twitter, you may have already heard about how I found this lottery ticket on the ground while I was on a field trip with my kid. I thought it was trash (LITTERBUGS! ARGH! ), so I picked it up to throw away when we got to the car. But when I saw it was a lottery ticket, I figured I’d check the numbers when I got home, just in case. I won the BIG money, honey! TWO WHOLE DOLLARS! WOO HOO!! Every morning, I sit down to do The PEACE System (a process I created to help clear my head and prioritize my day). Because field trips can be stressful – particularly with a special needs kid – I made a point of setting the intention to look for miracles. Frankly, a well-behaved child would have qualified as a miracle in my book. I certainly wasn’t expecting free money to fall at my feet. But hey, I’ll take it! I asked for (and was looking for) a miracle, and I got it. And the kid behaved, too! You’ve probably heard stories about people who say “I won the lottery and it changed my life.” Never did I think I’d be one of those people, since I don’t play the lottery. But winning those two bucks most certainly changed my life. “You can’t play if you don’t win” is a double-edged sword. In a way, I did “play” because I picked up the ticket and cashed it in. But in a way I didn’t play, because I didn’t actually buy the ticket. It wasn’t even given to me (in the traditional sense). And the person that dropped the ticket probably thought it was a “loser” because they played $10 and “only” won $2. They lost money on the deal. But from my perspective, I was $2 richer! The last 18 months have been arduous and hard for me on a lot of fronts. At some point, I probably faced down some depression, though I was never clinically diagnosed. I’ve done a LOT of questioning my worth, my value, and why I’m really on this planet in the first place. Two dollars won’t even buy me a soda at my local restaurant, let alone pay my rent, but it was a sign. A clear sign that miracles are there if we are looking for them. I know that sounds kind of mystical and metaphysical, but it’s true. I found that money because I was looking for it. Well, I was looking for a miracle, and I chose to see this “win” as a miracle. You have to have your eyes open and show up. You have to be willing to go for what matters to you – even if it seems unreasonable. Even if it seems impossible. If it’s in your heart to have it, you have to be courageous enough to show up for it. And keep showing up consistently. In that respect, Mom was right: you can’t win if you don’t play. But she was also wrong. I won without playing “the game” (by society’s rules, at least). That little lottery ticket opened a Pandora’s box of questions about the “teaching” that’s been passed down through my family for generations. The “lessons” and “stories” that, in a previous era, had to be true for survival no longer serve the person I’m becoming in this era of creative entrepreneurship. In the past, if you didn’t “play by the rules”, you wouldn’t be taken seriously, and you probably wouldn’t even get a foot in the door, let alone win. There were gatekeepers, expectations, and unwritten “rules” that were foisted on you by your industry, society and “the world”. These rules were designed to keep certain people out, and to protect the survival of others. You had to play their way, or you simply couldn’t play. Now, you have a lot more latitude to define success on your own terms and not just survive, but thrive. 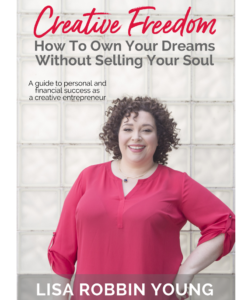 You can create your own career, doing what you love, and make good money doing it – without selling your soul. That’s the entire premise of how I help my clients! Those old stories that once served to protect, inspire, and motivate me, had been holding me back from the life and career I was meant to have. I couldn’t see that until I won the lottery. 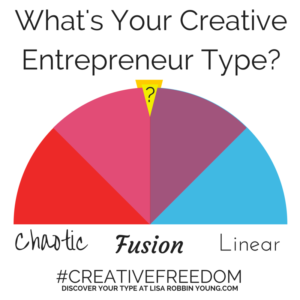 What thoughts, beliefs, and stories do you hold as true, that might actually be limiting your success without you even realizing it? Untangling those beliefs and thought patterns can be tough, but the rewards far outweigh the risks. But here’s the other thing that rattled my brain. I won $2. Winning anything was contingent upon someone else. Somebody else played the game, bought the ticket, left it on the ground. At least three other people walked right past the ticket before I picked it up. In short, I had no control over the outcome. All I could do was be in the right place at the time of the miracle. Miracles are awesome, and they can feel magical. But they are, in many ways, unpredictable – even if you’re looking for them. You don’t know when they’ll arrive, or in what form, and sometimes it’s hard to know if it even is a miracle until well after the fact. Sometimes the worst thing that ever happened to you is actually a blessing in disguise… a miracle you won’t see until years later. Waiting around for miracles is the snail’s path to success. Can it happen? Sure! I just won the lottery, for crying out loud! But, I only won $2, because that’s all the ticket was worth. Someone else got to dictate the terms of my success. I could only win what they played and paid for. I don’t want someone else to dictate how successful I can be. I don’t want someone else to have that much influence over my success journey. I mean, I won’t turn away blessings when they show up – even the $2 variety – and I’m not going out of my way to play the lottery, either. I know I can’t control everything – and some might say that control, like safety, is an illusion. But if I set an intention and follow it with consistent action, I’m going to move the ball further down the field more often than the guy standing around, waiting for a winning lottery ticket to fall at his feet. There were other gems of discovery that I’m still unpacking, and I’m sure you could tease out a few lessons of your own from this story, but ultimately, while I welcome all the miracles and blessings coming my way, I’m not going to sit on the sidelines and wait for them. I’m going to keep showing up, sharing my Great Work, and defining success on my terms. Not my mom’s terms, or the terms of my ancestors, or even the terms of my fans and clients. My game is the only game that matters for me. It’s a game I’m happy to play, and one I can’t lose, because I make the rules. Girl! You are the hard-workingest woman I know! You made SHOES for crying out loud… just for fun!